Walter Hill's Peckinpah-influenced Western classic exemplifies everything that is great about Walter Hill: Genre action as a form of art, his terrific ear for music, his montage-style editing, and his fetish for broken glass. By 1980, we were just starting the long doldrums of the Western genre. 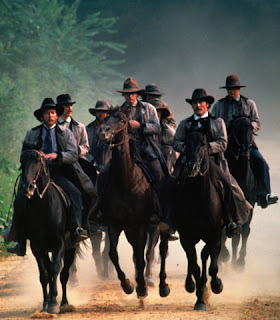 So maybe we can consider Walter Hill's The Long Riders the last great western. The story of Jesse James has been the subject of a hundred films over the last century, and arguably Walter Hill's is the top bar. Walter Hill, known mainly as one of the best action directors of the ‘80s, was once a protégé of Sam Peckinpah, having written his fine Steve McQueen/Ali McGraw heist film The Getaway. The Peckinpah influence on Hill and The Long Riders is palpable. Hill was a master of writing and directing mean and nasty characters, and the conflict between the James/Younger Gang and the Pinkerton authorities is tough and bloody. The opening establishes the steely eyed toughness of Jesse James (James Keach), who is introduced robbing a bank with his brother Frank (Stacy Keach) and his cohorts, the Youngers (the Carradine brothers) and the Millers (the Quaid brothers). After the trigger-happy Ed Miller gets kicked out of the gang, seeds of internal dissent within the group are born. As they move between train robberies, bank heists, visits to whorehouses and even time spent at home with families, we see the concurrent actions of the Federal Government officers, The Pinkertons, to apprehend the gang. As the opening Ry Cooder bluegrass tune plays over the elegant slow-motion footage of the gang riding across the lush green Missouri landscape, the reverence of both the genre and the history of the period is established. This tone continues throughout the mix of gritty actions scenes and genuine heartfelt nostalgia. Hill paints his characters as real working class people, but also aggrandized criminals who have helped form the myths and legends of the emerging nation. The numerous action set pieces are phenomenal. The knife fight between James Remar and David Carradine is terrific. The battle between two badass characters – Remar, the muscular half-breed and husband to Pamela Reed's character, and David Carradine, the quiet and Zen-like client of the whore – is an awesome macho standoff. Hill saves his best scene for last. It’s not only the best of his career, it’s one of the greatest action set pieces ever filmed by anyone. Hill applies all the Peckinpah influence and knowledge he gleaned from the ‘70s into his mesmerizing Minnesota raid bloodbath. The multiple camera frame rates and the same montage rhythm is the finest and most famous Peckinpah homage we've seen. The Long Riders is available on Blu-ray from MGM Home Entertainment.